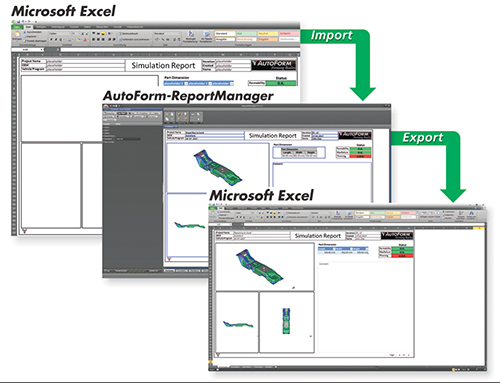 AutoForm Engineering Gmbh announced that it has integrated the generation of reports in Excel format within its latest software version, AutoFormplus R7. As a result, users can import and process Excel files as report templates directly in AutoForm-ReportManager, and also can export reports generated in AutoForm-ReportManager to Excel. In daily practice, many companies use their own report templates to facilitate internal communication between departments. However, when collaborating with other companies, data that is not compatible or up to date can be a source of misinterpretation, leading to time losses and increased costs. AutoForm-ReportManager, an integrated part of AutoFormplus, enables engineers to easily and rapidly create reports based on simulation results. The data from a simulation file easily can be included in the report—automatically updated to reflect current results. Experience has shown that Excel files are best-suited to fulfill all of the requirements related to these types of reports. With the latest release of AutoFormplus R7, report templates originally generated in Excel can be imported and processed in AutoForm-ReportManager, and saved to the simulation file. These report templates include mapped objects such as 3D views and plots, variables, diagrams, data sets, and tables. And, when the reports generated in AutoForm-ReportManager are exported to Excel, they can be used for any purposes independent of AutoForm software, as well as exported as a template for other AutoForm simulations.